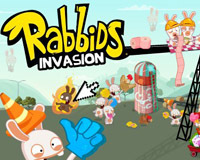 Rabbids Invasion or (Rabbids – The Lapins Crétins: Invasion) is a fantastic new Facebook game from Ubisoft. 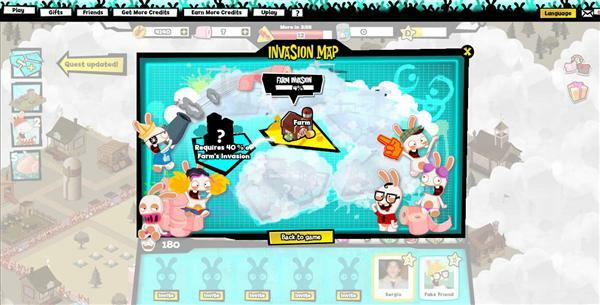 With astonishing visuals and ridiculously hilarious gameplay and twisted humor, Rabbids Invasion presents itself as a great new city building experience or better a city destroying one. 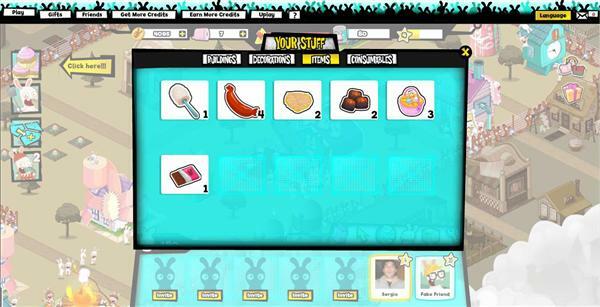 Rabbids get unleashed on the most popular social network and are determined to make a mess of everything, including Facebook, and run things the Rabbid way! 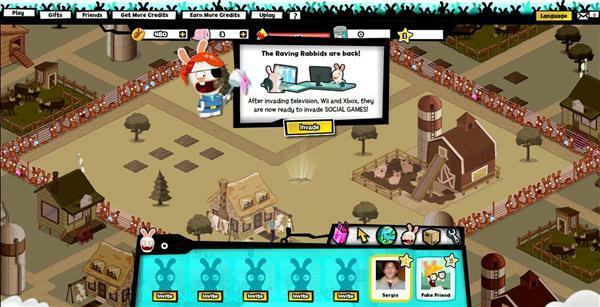 Embark on hysterical quests to rabbidize everyone’s favorite social games. 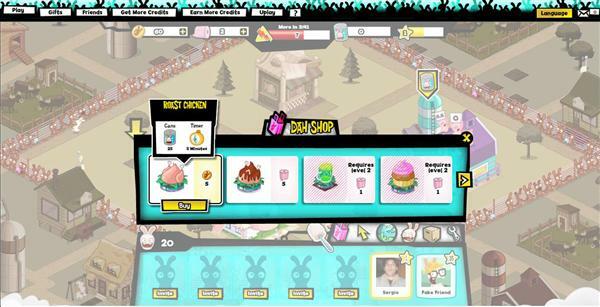 Wreak havoc and spread mayhem in an all-out Facebook invasion! The Rabbids are about to bring craziness to social gaming and you’re invited to the party! 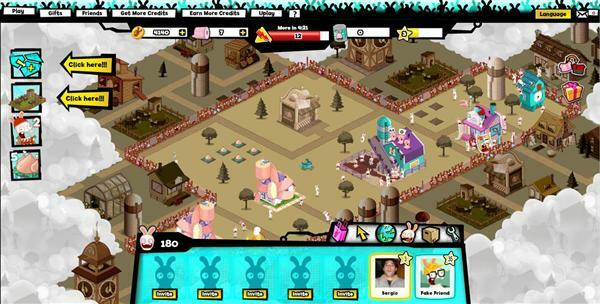 Rabbids Invasion is at its core a city building game, but where you first must destroy to rebuild, rather than starting a city from scratch you have to conquer and destroy the human grayish civilization in place, from homes to farm, all is worth to replace with crazy colorful new buildings and items to fuel your Rabbids Invasion. Premium currency is represented by toilet paper and in order to expand you’ll need sausages, thats the type of ridiculous and funny stuff you’ll encounter while playing this title, the tutorial and overall gameplay is fast and does its job to entertain players on their mission. City Building players will feel at home with the gameplay mechanics, energy, experience, level up and rewards are pretty much the same as in other titles in the genre, but by adding invasion stages, players have more short term goals to play for, adding a greater sense of progression. As usual new items and buildings are unlocked as you play, some at level ups other after a percentage of the invasion is reached. 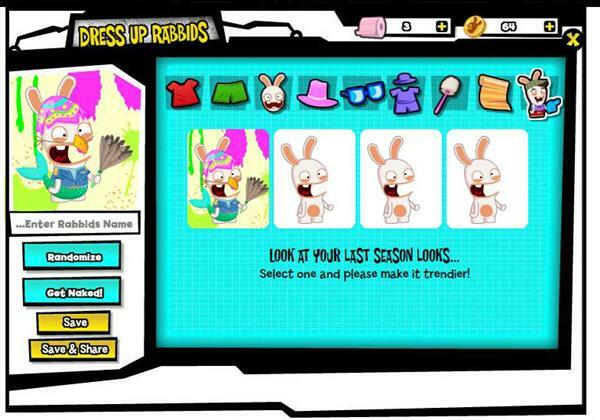 You can also customize you avatar, with clothes and other items. Rabbids Invasion offers a fresh new look over city building games and a really enjoyable and funny gaming experience for everyone! The ultimate Facebook farce! Invade iconic cities styled from popular Facebook games, transforming every residence, store, and decorative feature into wacky, over-the-top caricatures! Try your hand at farming by planting burgers, stinky cheese, and other bizarre things that can be harvested to supply your shops! Save up your precious toilet paper then go on a shopping spree to buy exclusive items for prestige and bragging rights! The Rabbids world is alive and chaotic! Grow your invasion from a tiny farm and working your way up to a sprawling metropolis. Check back often, because your world evolves in unpredictable ways while you are offline! Harass the Neighbors! Bust on into your friends’ towns to help spread the Rabbids mayhem for bonus points and exciting rewards. Upgrade your relationships and become Best Bunnies Forever to share extra special benefits! The Rabbids invade your Facebook page! Show off your progression to the rest of the community through a special Rabbidized Facebook page where you can post funny requests, beg for stuff, and poke fun at your friends! Rabbidize yourself! Create a Raving Ravatar of yourself fully blinged out with accessories and epic outfits! But don’t stop there, Rabbize your friends, your family, and your favorite celebrities for laughs and embarrassment! Additional Content on the way! Don’t miss the next update, including brand new environments to spoof, crazy collections to complete, new quests, and also the launch of the Bwaaazette, the official Rabbids newspaper delivering the hottest raving news! Related Tags: city building, Ubisoft.